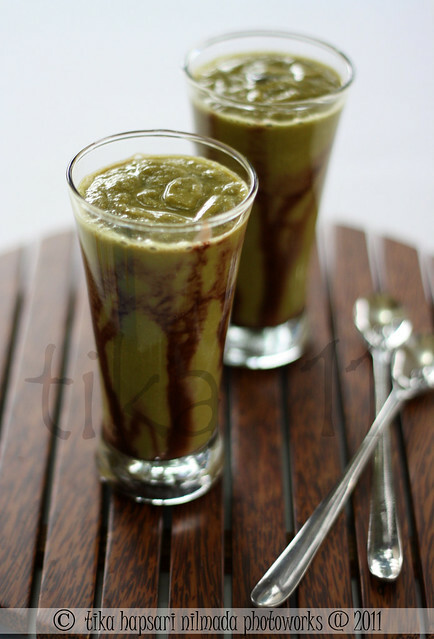 Avocado juice or jus alpukat is very famous drink/dessert in Indonesia. You can make it on your own or buy it in a fresh fruit juice stall (here in my country, you can find fresh fruit juice stalls everywhere). Considering the cleanness standard, I'd rather to make my own avocado juice. The best for my family ! Blend them all together in a blender until smooth. Before you pour it into the glass, rub chocolate condensed milk on the inside wall of the glasses. When you finished, pour avocado juice. Ready to be served. P.S : to read behind the scene story click here. I was craving to make Strawberry cheese pie, that's why I bought 250 gr of cream cheese. But it was hard to find fresh strawberries at the market (I don't know why). Weeks gone by, the cream cheese still remain where it belong in the fridge. Until I take a look at the expired date, "oh no....it will be expired within two days !" 1 Preheat oven to 350 degrees F (175 degrees C). Line muffin tins with paper cups or lightly spray with non-stick cooking spray. 2. In a medium bowl, beat the cream cheese, egg, 1/3 cup sugar and 1/8 teaspoon salt until light and fluffy. Stir in the chocolate chips and set aside. 3. In a large bowl, mix together the flour, 1 cup sugar, cocoa, baking soda and 1/2 teaspoon salt. Make a well in the center and add the water, oil, vinegar and vanilla. Stir together until well blended. 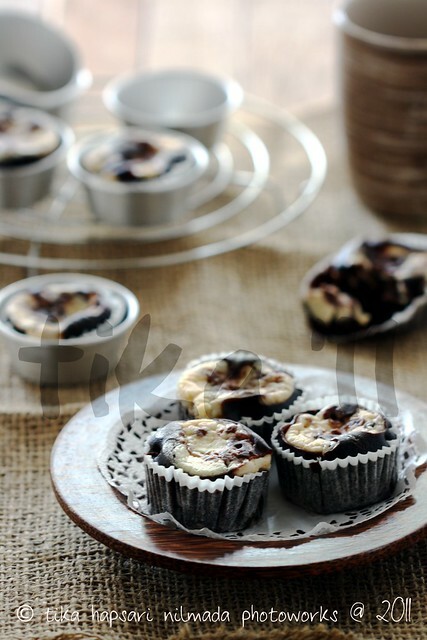 Fill muffin tins 1/3 full with the batter and top with a dollop of the cream cheese mixture. 4. Bake in preheated oven for 25 to 30 minutes. 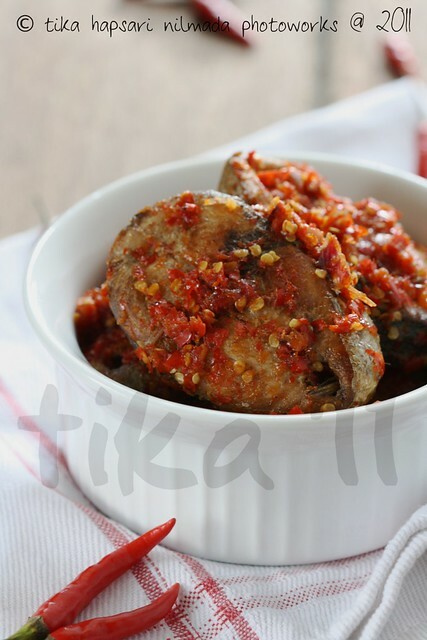 Cob fish balado means cob fish dipped in spicy red sauce. 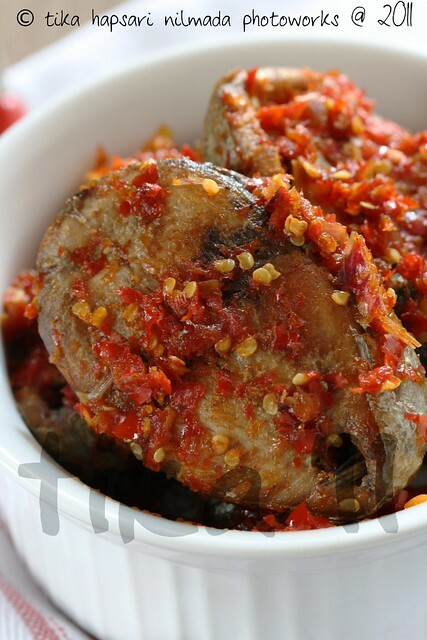 Generously spiced "balado" dishes contain crushed green or red chili peppers. 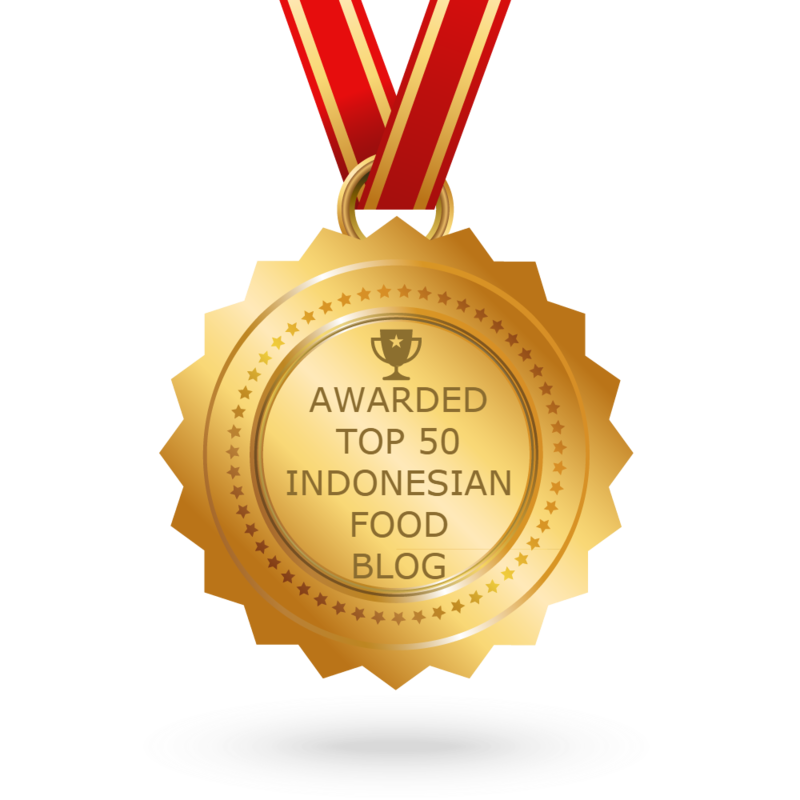 This one is my version of balado (not the original one from West Sumatra). It's quite easy and simple, and worth every penny. Being a working mom is as rewarding as it is challenging. I always want to do anything to the limit on the week end. 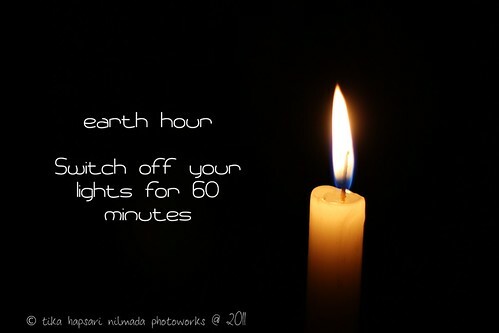 This related to cooking, traveling, house cleaning, photographing and playing with my son. As for cooking, I look for recipes that match our well pampered taste buds. Twice in a week, it's really not a problem at all. - 1 cob fish, cut into serving pieces. Wash and marinate it with salt and lemon juice, set aside. 1. Heat oil in large skillet over medium heat. Fry the fish until golden brown, remove from the pan and set a side. 3. Use the same skillet for frying the fish. Remove some oil from it and remain about 3 tablespoon oil. Add chili sauce and stir fry until fragrant. 4. Add the fried fish. Stir well. 5. Add water, stir evenly. Cook until dry and the fish covered up by the spices. 1. Panaskan minyak goreng di wajan. Goreng ikan tongkol sampai berwarna agak kecoklatan, angkat dan sisihkan. 2. Haluskan cabe, bawang merah dan bawang putih. 3. Panaskan 3 sdm minyak goreng bekas menggoreng ikan, masukkan bumbu halus. Tumis hingga harum. 5. Tambahkan air. Masak sampai air habis dan bumbu rata di permukaan ikan. P.S : The first photo in this post has been criticized by Dario Milano on Food Photography Critique-2. But, I'm not the one who regularly eat an apple a day (uppsss...). 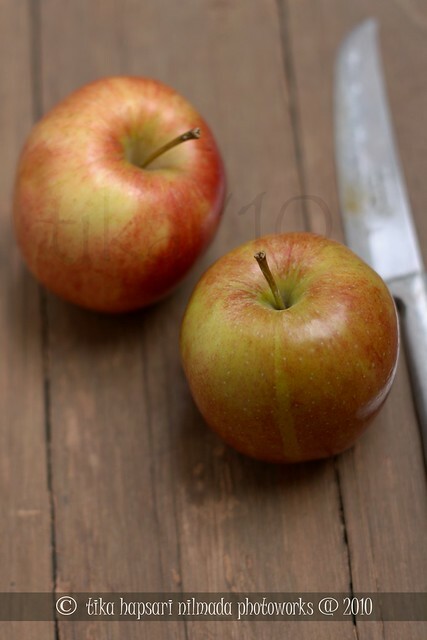 I usually serve apple in a simple way, cut apple into pieces then soak in salty cold water for a while. Drain before you eat it. Works well if you are adding apples to fruit salad. 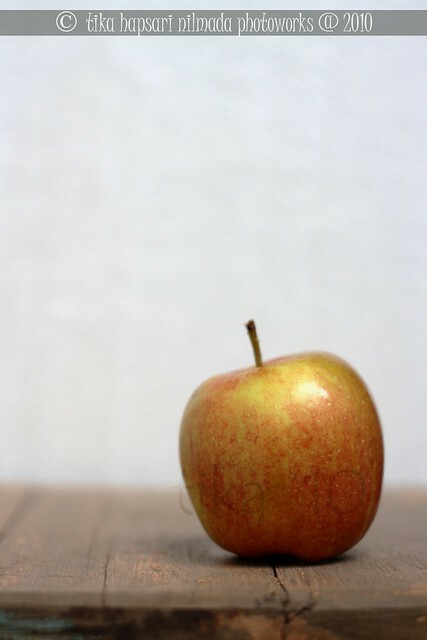 Apple for afternoon snack at tea time ? Perhaps this might give you an idea of light snack served with a cup of tea or coffee. 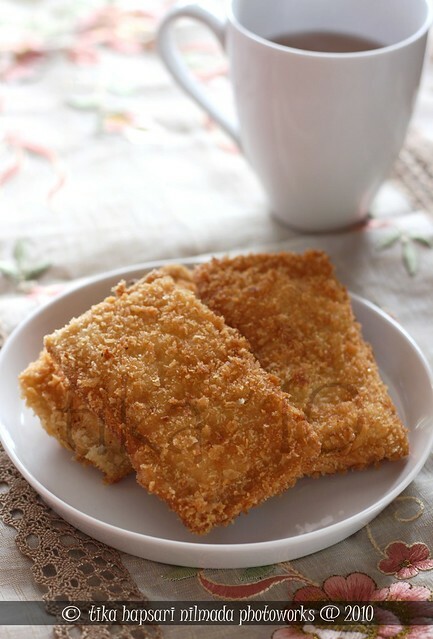 Fried bread with apple filling or Roti goreng isi apel. Super duper easy. You don't need to make your own bread, you can use store-bought square white bread. 1. Wash apples, peeled and cored. Slice thinly. 2. Preheat the skillet with margarine. Saute apple, palm sugar, clove powder and cinnamon powder until tender. 3. Take 1 slice of white bread, roll it out thinly. Do the same to all slices. 4. Put the apple mixture in the middle of the white bread, fold in the same size. Glued with egg white. Then press firmly the edges with tines of a fork. 5. Dip them in a beaten egg white & coat them with desiccated coconut. 7. When is done, remove from the heat and drain. Serve as naughty snacks. 1. Kupas apel, buang bijinya. Iris tipis-tipis. 2. Panaskan margarin, masukkan apel, gula palem, cengkeh dan kayu manis bubuk. Masak hingga layu. Angkat. 3. Ambil roti tawar, tipiskan. 4. Isi dengan apel, oles pinggiran dengan putih telur. Lipat dua. Rekatkan dengan ujung tajam garpu. 5. Celupkan roti dalam putih telur, gulingkan ke kelapa kering. Ratakan. 6. Panaskan minyak, goreng roti hingga kecoklatan. 7. Angkat dan tiriskan. Siap dihidangkan.